Crime writing frequently takes centre stage at book festivals worldwide. In the aftermath of Ullapool Book Festival, our monthly columnist delves into the genre via in-depth examination of Glasgow-based author – and former Taggart scriptwriter – Chris Dolan. David finds the author’s unabashed fondness for his central protagonist, Procurator Fiscal Maddy Shannon, and the complex narrative action, which typically expands beyond police/legal procedural, to be refreshing and ultimately compelling. A quote like that should really be printed in ironics – the backward-slanting italic typeface that both HL Mencken and Tom Driberg suggested ought to be used to alert us to irony. Because the famous crime writer I was talking to didn’t, I think, mean to deprecate the genre that had made her rich. Instead she meant to mock the notion that all wannabe crime writers could also, and just as easily, come up with the credible psychology, characterisation, motivation, social observation and everything else that completes the crime fiction mix. Many literary novelists might try to provide these things too, but the crime novelist has to do so while at the same time stitching in an exciting and engaging plot. It’s like they always said about Ginger Rogers and Fred Astaire: she did everything he did, except backwards and in high heels. Crime figured prominently on the programme at the ever-wonderful Ullapool Book Festival last weekend, with the last day alone featuring Graeme Macrae Burnet talking about his Saltire award-winning His Bloody Project and Val McDermid discussing her 30th novel, Out of Bounds. Yet it was something that Chris Dolan – a comparative newcomer to the genre with just two crime novels under his belt – had to say that got me thinking. The first thing you should know about Dolan is that he understands how crime fiction works. It would be rather surprising if he didn’t, considering that he has also written scripts for Taggart and that he is currently adapting his sixth Ian Rankin novel for Radio 4. Yet when he first set about writing a crime novel of his own, with Potter’s Field in 2014 and Lies of the Land last year (both published by Vagabond Voices) he hardly made things easy for himself. His lead character in both, Maddy Shannon, is a procurator fiscal. Although fiscals do have some involvement in murder cases, usually they’re not the people turning up new clues. Indeed, if fiscals get too involved in other cases, eyebrows would be raised – and in legal circles that counts for almost as much as a written warning. In other words, a fictional Scottish equivalent of the crime-busting magistrate in the French TV cop show Spiral is, while theoretically possible, a tad unlikely. Whoa. Let’s just back up a bit there. Did you hear what he just said? Maybe I have made a mistake? When have you ever heard a crime writer actually admitting that? I don’t know about you, but I don’t think I ever have. I’ve heard Ian Rankin admit that he wished Rebus hadn’t hit retirement age, but this is like hearing him admit Rebus was in the wrong job altogether. A crime writer who admits he’s got a few doubts about his lead character is like an asthmatic balloon modeller: the job might get done but you’re not sure you want to see it. There is, I must emphasise, a crime at the heart of Lies of the Land: it’s based on a real-life (but not hugely famous) scandal in Glasgow and here it has spawned its own series of (fictional) murders. But for me the joy of the book is the way it immerses itself in a dense mesh of office politics, in rivalries and resentments between police and fiscals, in the bureaucracy involved in bringing a case to trial, or the overlap of past cases. And that’s just the work side of things, which Dolan has researched properly, going even as far as spending a day with former Lord Advocate (and former fiscal) Dame Elish Angiolini. We have, you might think, come a long way from the simplicities of “There’s been a murrrderrr”. But actually we haven’t. Because Dolan first started writing Maddy for STV when they were casting around for something to replace Taggart. They turned it down. Maybe it was too complex, too multi-layered, too much of a risk. I don’t know about you, but I quite like my crime fiction that way. 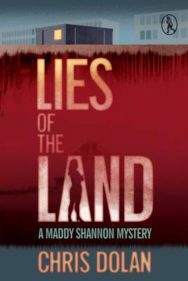 Lies of The Land by Chris Dolan is out now published by Vagabond Voices priced £9.95. You can read an extract from Potter’s Field, by Chris Dolan, here on Books from Scotland. Find out more about Ullapool Book Festival here.